At its semiannual meeting on Thursday, OMRF named The Honorable Terence Kern to its board of directors, honored long-time director David Rainbolt and named Judith James, M.D., Ph.D. its first Vice President of Clinical Affairs. Judge Kern, of Tulsa, is a Senior Judge on the U.S. District Court for the Northern District of Oklahoma. 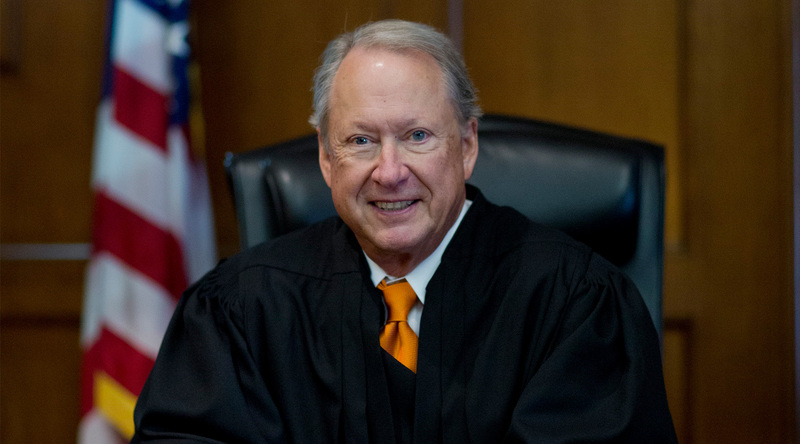 A native of Clinton, Okla., Judge Kern graduated from Oklahoma State University and subsequently from the University of Oklahoma School of Law. A former Army reserve member and attorney at the Federal Trade Commission, he practiced as an attorney in Ardmore for 24 years before being named to the federal bench in 1994. He served as Chief Judge of the Northern District for seven years and took senior status in 2010. Last month, he was inducted into the OSU Hall of Fame. Rainbolt was presented with the OMRF Board of Directors Distinguished Service Award. Rainbolt, who is Chief Executive Officer of Bancfirst, joined OMRF’s board in 1994 and has served in numerous leadership roles during his 23-year tenure as an OMRF director. Also at the meeting, the foundation named Judith James, M.D., Ph.D., a physician-scientist, as Vice President of Clinical Affairs. In that role, she will oversee all clinical activities at the foundation, which treats and conducts clinical research projects involving thousands of patients suffering from lupus, rheumatoid arthritis and multiple sclerosis. A native of Pond Creek, Okla., James earned her M.D. and Ph.D. degrees from the University of Oklahoma Health Sciences Center and joined OMRF’s scientific staff in 1994. An internationally acclaimed researcher, she is best known for her work in the prediction and prevention of the autoimmune disease lupus. Her research has resulted in OMRF being named a National Institutes of Health Autoimmunity Center of Excellence, one of only 10 nationwide. She is chair of OMRF’s Arthritis and Clinical Immunology Research Program and holds the Lou C. Kerr Endowed Chair in Biomedical Research. Umesh Deshmukh, Ph.D., was presented with the J. Donald & Patricia H. Capra Award for Scientific Achievement for his research on the autoimmune disease Sjögren’s syndrome. Sathish Srinivasan, Ph.D., received the Fred Jones Award for Scientific Achievement. Srinivasan focuses his research on lymphedema, a disorder of the vascular system. Finally, OMRF presented the Edward L. and Thelma Gaylord Prize for Scientific Achievement to Holly Van Remmen, Ph.D. The award is OMRF’s highest scientific prize, and it went to Van Remmen for her research on neurodegeneration and muscle loss in aging. The award is named for the late Edward L. Gaylord, who served on OMRF’s board for 30 years, and his wife, Thelma. The Gaylords’ daughter, Christy Everest, currently serves on the foundation’s board. Van Remmen earned her Ph.D. from the University of Texas Health Sciences Center, San Antonio, where she was a faculty member until joining OMRF in 2013. At OMRF, she leads the Aging & Metabolism Research Program and holds the G.T. Blankenship Chair in Aging Research.